The day of the wedding, the whole reason we were in Park City, I was on my own for lunch. J was a bridesmaid and had a lot to do before the 6 PM wedding. She started the day with breakfast with one of the other bridesmaids and a longtime friend at the Main Street Deli then went back in to Salt Lake City with the bride to get her hair done. That means I was on my own for lunch. Not being one to pass up the opportunity to sleep, I slept in a little later than normal, but when I woke up, I was hungry. Our hotel was right on Main Street, so I really could walk to a number of places for lunch. The place I chose actually came recommended from a friend. 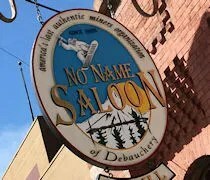 The No Name Saloon is on Main Street in historic downtown Park City. It’s a pretty traditional bar with a couple of different dining rooms and a great rooftop for outdoor dining. Since I was alone, I chose to just sit at the bar. The Saloon was pretty empty when I walked in around 11:00, but is started filling up quickly as I was eating lunch. Most people were heading for the rooftop as it was a fabulous day in Northern Utah and the midday sun was not quite beating down on the resort town. The bartender wasn’t behind the bar when I sat down, but she noticed me pretty quickly and grabbed a menu. I couldn’t quite tell what beers they had on top so I just asked for whatever the Boulevard Brewing Company tap was. 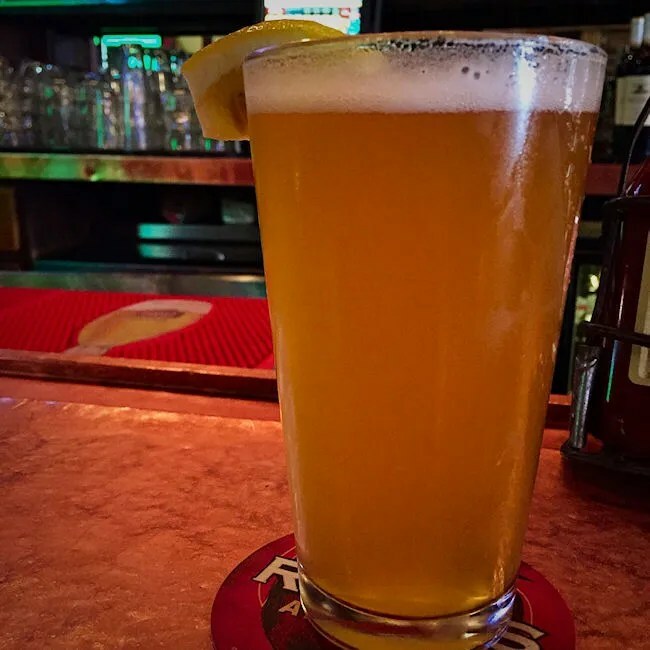 Turns out, it was their Unfiltered Wheat Beer which was served with an orange and tasted similar to an Oberon. Not bad. Very light and refreshing and a good way to start the day. 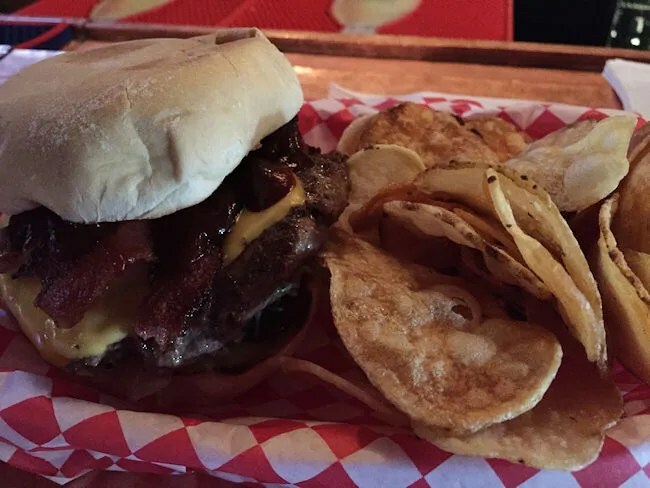 The marquee menu item at the No Name Saloon is their Buffalo burgers. I ordered the BBQ Bacon Cheeseburger. The 100% pure buffalo burger is topped with grilled onions, cheese, lettuce, bacon, and BBQ sauce. I asked to leave the onions off and scrapped off most of the lettuce to leave a delicious, messy burger. The BBQ sauce was a little sweet yet a little bitter, the meat itself was so juicy with a slightly pink center, and the bacon was super crispy. The sandwich was served with house made buffalo chips. These chips are a little bit thicker than regular potato chips yet not so thick that you can call them french fries. They were nicely crispy and cooked pretty well all the way through. I used a little bit of the extra BBQ sauce that had dripped off my burger to dip the chips in to. My bill for lunch by myself was right around $20. 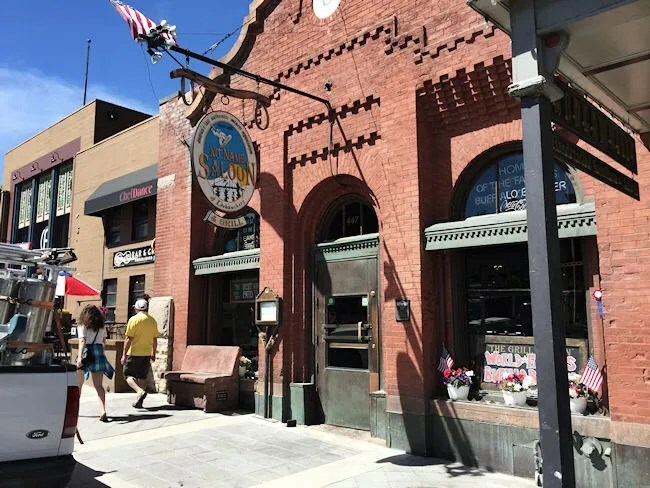 Like most things in Park City, it’s a little on the high, but No Name Saloon is a great alternative to a lot of the really fancy places in town. You still get a great meal, but it’s a really relaxed and comfy atmosphere for someone like me.